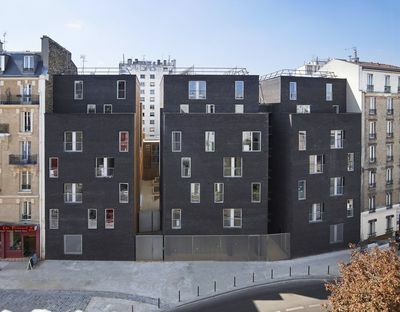 LAN architecture of Frances uses materials to characterise a student housing complex in the La Chapelle district of Paris, next to the redeveloped ZAC Pajol area. The themes of integration and privacy are addressed along with reduction of energy resources, earning the work Habitat et Environnement THPE certification in France. Not far from the Gare de l’Est in Paris, near the old railway site now included in the ZAC Pajol, an urban redevelopment project including restoration and conversion of the Halle Pajol to create a public centre powered by solar energy, is a lot for which the CROUS (Centre Régional des Oeuvres Universitaires et Scolaires de Paris) had announced a competition for construction of a student residence. The entry by LAN architecture which won the competition in 2007 fits into the neighbourhood with the same vocation for careful management of energy resources combined with urban integration and private comfort which, like two sides of the same coin, constitute the goal of architecture which has a public form and a private function. Built around a green courtyard, the three housing blocks offer Rue Pajol a façade broken up by the irregular rhythm of the windows, which visually integrate the new complex into the existing buildings which have been built at different times in history and include different types, ranging from cultural centres to art and crafts studios and small workshops. Arranged on six levels, the building has two entrances to the apartments, which overlook the inner courtyard, on its front wall and a large entrance hall on the ground floor with covered bicycle parking. The building?s transparency allows it to establish a dialogue with its surroundings, integrating it into the urban fabric around it even while offering all the privacy and security required for multi-unit student residences. The 143 apartments with common areas and administrative offices are organised around a garden measuring 15 x 15 metres: the layout of each residential unit has a living room on the outside facing the courtyard, with the service areas on the inside, so that natural light penetrates effectively and all tenants can enjoy the best possible views of the greenery. Materials are the element differentiating and qualifying the buildings. The dark brick of the outer façades contrasts with the larch wood boards on all the walls facing the inner courtyard. The naturalness of wood and the soil in the garden identify the private space. The insulated concrete structure, use of solar panels and double-glazed windows and good natural ventilation due to thermal exchange between the building and the courtyard have earned the building French Habitat et Environnement THPE.